MetroDecor 00601MDCO - Functional & versatile: create coordinated organization in drawers, dresser tops, dresser drawers, tweens and adults; Use anywhere you want to add a little fun and whimsy to your organizational needs; Great for closets, changing tables, cabinets and dressers; Great for children, linen closets, closets, bedrooms, shelves, playrooms, dorm rooms and more. Quality construction: made of breathable non-woven synthetic fabric; Reinforced sides keep items secure and the bins keep their shape; Easy Care - wipe clean with a damp cloth and allow to air dry. Instant organization: features 16 compartments to organize small items; store and organize socks, medical supplies, diaper rash creams and ointments, hair accessories, lotion, head bands, aspirators, hair brushes, baby mits and hats, shoes, combs, medicine, onesies, thermometers and more; Mix and match with other mDesign storage organizers for endless organizational possibilities. Stylish storage: this soft storage organizer keeps closet and nursery room clutter under control by storing all of your little one's essentials; This bin is divided into 16 sections allowing you to separate items; This organizer makes it easy to find exactly what you need, when you need it; Perfect for busy moms; Use multiples together to create a large organizational set for coordinated storage throughout the room. 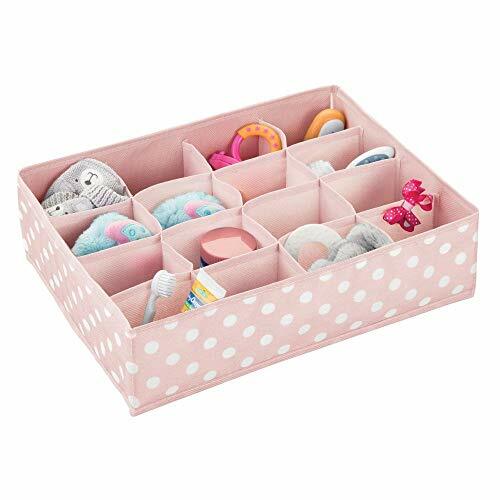 Large 16 Section Organizer - mDesign Soft Fabric Dresser Drawer and Closet Storage Organizer for Child/Kids Room and Nursery - Polka Dot Print - Pink/White - Place organizer in drawers, closets or on top of dressers and changing tables. Create customized storage in your baby's room or nursery with the Fabric Storage Organizer from mDesign. 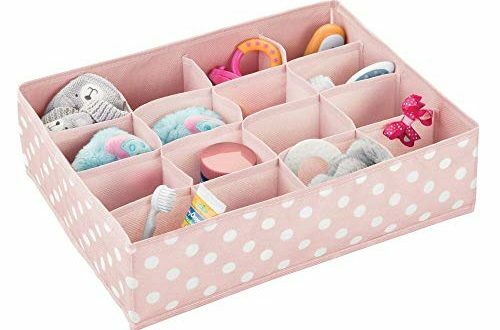 The organizer separates and stores all of your little one's essentials, socks and shoes, and make it easy to find and grab what you need right away! 16 Compartments hold smaller items like hats, hair bands and other small accessories in one convenient place. Gerber Children's Apparel - Pack of 3 coordinating burp cloths. Prefolded panels. 20 x 14. Gerber over-the-shoulder burpcloths are especially designed for when feeding and burping baby and extra absorbent to keep you dry. Finished edges for added durability and to prevent fraying.